No, we are not in danger. Santa Cruz Etla remains a quiet place. Folks get up at dawn and —in most cases— go to bed when the sun sets. That’s in part because for neighbors on the economic margin, electricity is expensive. 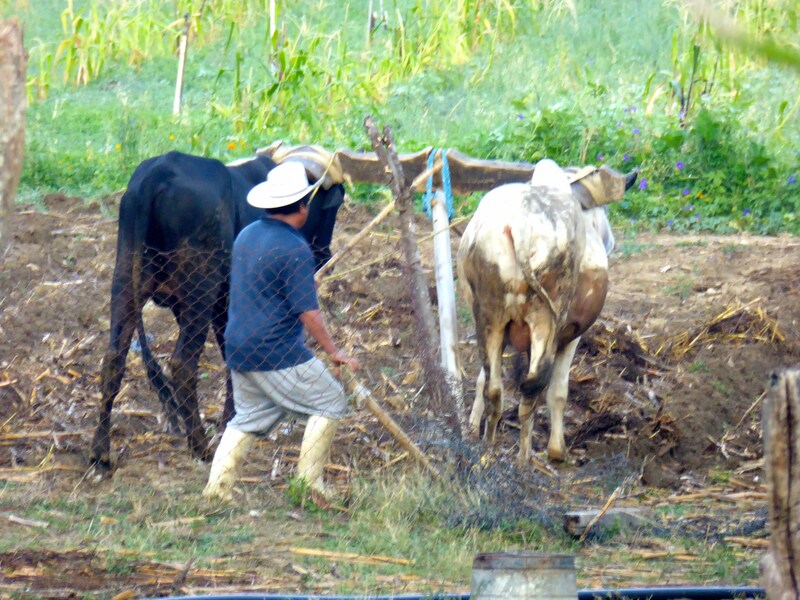 Oxen plow the fields to prepare for corn and beans and squash. Even people who work in the city sometimes do a little field work in the early light before taking a moto-taxi down to the highway and a colectivo cab into Oaxaca. Parents whose schedules permit (and if not, the grandparents), walk kids in spanking-clean red uniforms to school at 8 and pick them up at 2; the older kids group and manage on their own. So the best time to visit Santa Cruz is still now, and the next best time is the day after now, because the welcome mat is out at Casa DaviLinda and its Casita. The first and second questions: WE are not at war, but the local chapter of the national teachers union, Section 22 of the SNTE (Sindicato Nacional de Trabajadores de la Educación) and the CNTE (Coordinadora Nacional de Trabajadores de la Educación) is very much at war with the federal government over the Education Reform Laws. And their war is making life difficult for the citizenry in general, and is causing havoc with Oaxaca’s economy and many people’s optimism about the future. * According to a Program for International Student Assessment Report, Mexico ranks toward the bottom among OECD (Organization for Economic Cooperation and Development) countries in student achievement in reading, math and science skills. [http://gppreview.com/2016/03/10/mexicos-education-reform-what-went-wrong/] In fact, in the World Economic Forum's latest annual competitiveness survey, Mexico ranked 118th out of 144 countries in quality of primary education behind Bangla Desh, Bolivia, and Sierra Leone. *The teachers union has for many years controlled most of the money that the federal government channels to education, and has also controlled all hiring, promotion, layoffs, etc. [http://www.express.co.uk/news/world/679318/teachers-protest-violent-mexico] The union controlled who got the jobs, and in fact sometimes individual teachers were able to name their successors, without regard to qualifications. One of the people who works part time for me and Linda told me that some years ago he was offered a teaching position, but his family couldn’t raise the amount the union was charging. He lamented that had he been able to purchase the position, he could by now have retired with a good pension. * There seems to be a general sense that there are widespread, but by no means universal, problems with pedagogy at the elementary and secondary level. There are some teachers who are not competent in the subjects that they teach. And there is an overemphasis on rote repetition, rather than on learning strategies that fit individual students. There has been NO evaluation of teachers’ performance in any fashion, and a non-negotiable, bottom-line, demand of the union is that there be no evaluation of teachers for any reason, by any body, ever. * The last time the federal government attempted serious education reform, ten years ago, the national teachers marched, blockaded roads, persuaded other unions to join in a general strike, came close to shutting the country down, and, after some of the protests turned violent (as in Oaxaca), backed off. So, in the spirit of caveat emptor, please be advised that foregoing are gross oversimplifications. For the curious among us, there are dozens of books and thousands of websites on Mexico’s attempts at education reform. However, almost all writing on these matters is partisan, often stridently, sometime subtly. Facts are almost always in dispute. Conspiracy theories abound and motives —of the unions, of successive state and federal governments— are ascribed willy-nilly. Still, as residents here, we feel obligated to try to make sense of it all . . . This week the head of Sección 22 of the union was arrested for malfeasance: the union is accused of having cut a deal with companies who market to the schools for a 3.5% commission on all sales to be used by the union for funding its demonstrations and for the personal enrichment of the leadership. Over the last two years 24 million pesos (nearly $1.3 million US), went directly to pockets of the union president. Other leaders have been arrested for destroying private and public property. The union believes these arrests were politically motivated and that their leaders are political prisoners who must be freed prior to any negotiation. The government claims that the acts were criminal, and criminal law applies. Both sides are probably right. * Minimum standards of competence set with input from teachers, government, parents’ organizations, and the like. Transparency is key. Areas to be considered: competency in content, pedagogical skills, classroom management, student learning outcomes. * Teachers will be evaluated. By an institute created —with input from teachers, government, parents— to conduct the evaluations in accord with locally specific conditions and interests. * Teachers with tenure (1 year in job) will not risk being fired; they will have 3 evaluation opportunities to meet the standards of competence. There will be classes, workshops, tutorials, etc., to help bring people to standard. If, after 3 tries, competence levels are still not reached, the teachers will be assigned to other, non-teaching administrative functions. There will be opportunities and vehicles for appeal. * Recognition and monetary incentives for teachers who excel. Need to address the relevance of the educational model, and its reliance on rote. Method of monitoring cost effectiveness. Design of everything needs to be more bottom-up and less top-down. As far as the law goes (and from what I’ve read, I believe it needs to go farther), what the government has offered, at least on the face of it, seems to me to make pretty good sense. This is presuming – and the presumption is questioned at every step by groups opposed to the reform – that its provisions are implemented fairly and not punitively. As they say around here, Del dicho al hecho hay gran trecho: it’s a long way between the saying and the doing, between the proposals and the implementation. The blockades and the sit-ins have been going on for . . . well, since we began residing part time in Oaxaca five years ago? No, since at least the previous round of reform attempts in 2006? Well, really, pretty much every year since the national convulsions of Tlatelolco in the Olympic summer of 1968? No, before that. In fact, I recall seeing them during my first extended visit to Mexico in the summer of 1960, when the grandparents of the folks currently camped in front of Oaxaca’s Municipio in the Zócalo probably first put up their tents in the plaza. On another hand, it’s just as likely that in the time of Benito Juárez . . . .
From most people, of course, the most relevant concern is not the issues underlying the trench warfare between the union and the government, but day-to-day coping with the chaos that these protests are causing to the citizenry of Oaxaca and all of southern Mexico. Soon, part 2 of 3: coping with chaos.